From your Oberlo admin click "Settings" to access your store settings. The page consists of two main sections: general settings and auto update settings. Note: Store settings will not be visible if you haven't connected the Shopify store. Store name – add your Shopify store name. Set new products as published – once you import products to your shop from the Import list, products will automatically become visible to your visitors. Set products as taxable – select this option if you want to charge an additional tax when selling products. Set unit of measurement for product weight – allows you to change the weight of each product in the Import list before importing to shop. It is useful when you set weight based shipping rates in Shopify. Notify customer about the order fulfillment – if you enable this option, the notification email will be sent to the customer once the order is fulfilled with Oberlo. Custom shipping tracking URL – you can add the custom shipment tracking website URL in this field, which will be added to the notification emails. Your customers will be able to track their packages from the notification email sent by clicking on the tracking code. Check out this article for the detailed steps. Disable Shopify Login – enable this setting if you want to forbid logging into Oberlo through the Shopify admin > Apps page. Then, you and your team members will be able to log into the Oberlo through the app.oberlo.com/login page. Choose what you want Oberlo to do when the supplier no longer has the product available. Do Nothing option will not make any inventory changes in your Shopify store. 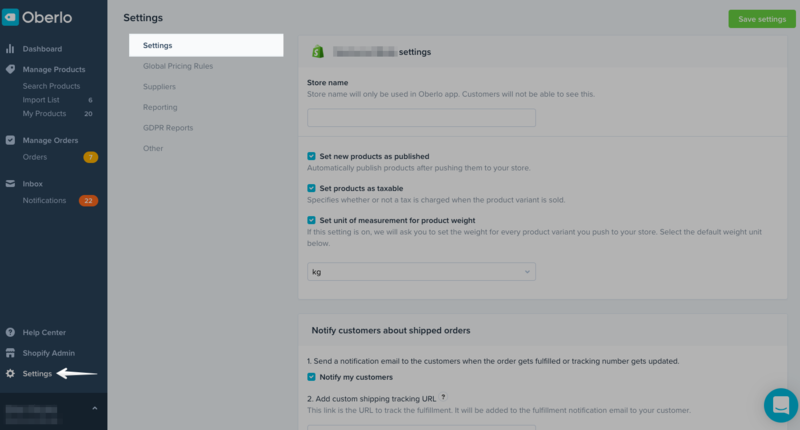 The Unpublish Product option will hide the product from your Shopify store and it will not be visible to your customers anymore. If the product is restocked by the supplier, Oberlo will not republish the product in your store. You will have to manually publish the product in Shopify admin and use the override feature to re-sync the level of inventory (if it was not updated yet). Set Quantity To Zero option will make your product "Out of stock". Your customers will be able to see it, however, they will not be able to order it. If the product is restocked by the supplier, Oberlo will change the stock to X if you have the auto updates setting "When inventory changes" selected as "Update Automatically". Then, your customers will be able to order the product again. Choose what you want Oberlo to do when the supplier no longer has the product variant available. Remove Variant option will remove the variant from the product page in your store. It will not be visible to your customers, so they will not be able to order it. If the product contains one variant, which is no longer available on the supplier's store, Oberlo will hide the product listing from your Shopify store. If the product variant is restocked by the supplier, Oberlo will not add the product variant in your store. You will have to override the whole product if you want have it in your store. Set Quantity To Zero option will make your product variant "Out of stock". Your customers will be able to see it, however, they will not be able to order it. If the product variant is restocked by the supplier, Oberlo will change the stock X if you have the auto updates setting "When inventory changes" selected as "Update Automatically". Then, your customers will be able to order that variant again. Choose what you want Oberlo to do when the product price is changed on the supplier's side. Do Nothing option will not make any product price changes in your Shopify store. Please note that the feature "Automatically update price when cost changes" will be disabled in the "My Products" and "Import List" pages if this setting is turned on. Update Price and Compared at Price option will update both product Price and Compared At Price in your Shopify store, according to your "Global Pricing Rules" settings. Update Price Only option will allow you to update Price only and leave out the Compared At Price. If you set your product prices manually, you then need to choose the "Do Nothing" option because Oberlo does not update prices automatically according to manually set prices. Choose what you want Oberlo to do when the level of product inventory changes on the supplier's side. Do Nothing option will not make any product inventory changes in your Shopify store. The update Automatically option will update the level of product inventory in your Shopify store. It is useful to keep track of the suppliers' stock. Note: Auto updates usually take place once a day, however, slight delays may occur. If it is urgent, please change prices and stock manually. Notify Me checkbox allows you to receive notifications when one of the previously mentioned events occur. You can check your notifications from the menu on the left side of Oberlo.